Data from the first phase of a major Minnesota vineyard trial has been tabulated, according to Dennis Emslie Drummond, VESTA Coordinator at Central Lakes College in Staples, Minnesota, about 130 miles northeast of the Twin Cities. 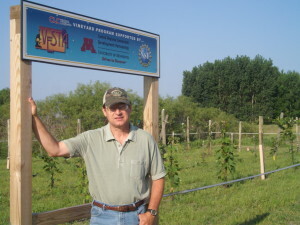 Drummond planted an experimental vineyard at Central Lakes during 2011 as part of a $203,000, four-year grant from the National Science Foundation. The project was also supported financially by the University of Minnesota. Growing grapes in USDA Zone 3 where temperatures occasionally reach -30F is a challenge. However, there are now a number of commercial wineries and vineyards operated in areas where the howl of a wolf can be heard on a cold winter night. Borealis (TP 2-1-17)- This wine grape from Minnesota grape breeder Tom Plocher is ‘very promising, with good Brix and low acid,” according to Drummond. 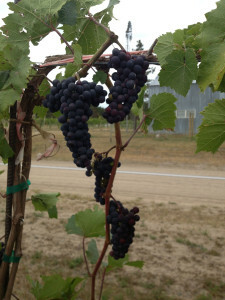 Most of the 2011 plantings of Borealis are healthy although the vines were slow to get started. Drummond reports that other experimental plantings of Borealis in Barnum, MN (30 miles south of Duluth) and Buffalo, ND (50 miles west of Fargo) have demonstrated a promising level of success. Plocher also reported that there are wineries producing test batches of Borealis wine. For the curious, samples of Borealis may be available to taste at the Cold Climate Conference in St.Paul this coming February, Drummond said. Marquette- Marquette is ‘the best of the bunch” that were planted in 2011 according to Drummond. This variety has the most shoots “on wire” of any of the 2011 plantings. However, both the Sabrevois and Brianna, which were planted in 2012, look better than the Marquette did after its first year. Drummond reports that Brianna has produced quality wine when it’s made from local grapes picked at a lower Brix. However Brianna has not been as vigorous as Sabrevois in the vineyard trials. Frontenac and Frontenac gris are doing much better this year after slowly getting established. Both types of Frontenac are being grown on both a high wire curtain and a vertical shoot positioning trellis. Currently, there is virtually no difference between vines grown on either trellis. ‘Maybe next year we will know if Frontenac does better with VSP,” Drummond said. Osceola Muscat, which was developed in Wisconsin, had very good trunk size and huge foliage, according to Drummond. But the one-year-old vines restarted from the ground after last year’s mild winter provided little snow to adequately insulate the ground. Many independent growers and nurseries generously donated cuttings for the program including Mark Hart, Bayview, WI, Del Schott, Bevins Creek Nursery, and Tom Plocher, Hugo, MN. During 2013, there was an additional planting Frontenac Blanc, Valiant and Edelweiss in the Central Lakes vineyard. After current NSF funding ends, Central Lakes College may continue to support the vineyard financially, Drummond said. The Central Lakes Agricultural Center, where the experimental vineyard is located, is on a ten-acre site which is owned by Central Lakes College. Central Lakes also has a 420 acre farm that is leased from the Staples Motley School District and Staples Economic Development Authority. Through the VESTA program, Central Lakes offers associates degrees in both viticulture and enology. Who bred Osceola Muscat? Is it safe to say Elmer did, or a fan of his? Seems to me there isn’t a great abundance of muscat varieties up here in MN. I’d be curious to try the wine or at least check the vine out. What’s the parents of this vine?